These movies like The Dark Tower prove the west only gets wilder after the apocalypse! Check them out & add them to your watch list now! The Dark Tower is an action, horror, science fantasy, western movie that will be released in theaters on August 4, 2017. As we mentioned in our trivia post, it is a continuation of the book series by Stephen King, of the same name. The movie stars Idris Elba, Matthew McConaughey and Tom Taylor. Here are some other movies like The Dark Tower. The Burrowers is a 2008 horror, thriller, western movie that is based on the 2008 short film- Blood Red Earth. When a family is kidnapped by unknown invaders, a search party consisting of Fergus Coffey, an Irish immigrant; Dobie Spacks, a naïve teenager; Walnut Callaghan, a former slave; John Clay, the community leader and William Parcher, an experienced Indian fighter, is tasked with trying to find them, as they encounter a species of creatures that prey on humans. The Burrowers stars Karl Geary as Fergus, Galen Hutchison as Dobie, Sean Patrick Thomas as Walnut, Clancy Brown as John and William Mapother as William. The Book of Eli is a 2010 post-apocalyptic, wester, action movie. Eli, a nomad, is tasked with guarding a mysterious book, that contains an array of secrets, as he journeys across the United States. However, along the way, Eli encounters Carnegie, who is seeking Eli’s book to control the people in his town. The Book of Eli stars Denzel Washington as Eli and Gary Oldman as Carnegie. Cowboys vs. Aliens is a 2011 sci-fi western movie that is based on the 2006 book, of the same name, by Scott Mitchell Rosenberg. A trio, including Jake Lonergan, an amnesiac wanted outlaw; Colonel Woodrow Dolarhyde, a ruthless, wealthy cattleman and Ella Swenson, a mysterious traveler, team together to save some of the residents of a small town in New Mexico Territory, who were abducted by a group of aliens. Cowboys vs. Aliens stars Daniel Craig as Jake, Harrison Ford as Colonel Woodrow and Olivia Wilde as Ella. Django Unchained is a 2012 drama western movie that is a stylized tribute to the 1966 Spaghetti Western movie- Django. Dr. King Schultz, a former dentist and current bounty hunter and Django Freeman, a freed slave, team up to save Django’s wife, Hildi von Shaft, who has been kidnapped by Calvin Candie, a cruel plantation owner. Django Unchained stars Christoph Waltz as Dr. Schultz, Jamie Foxx as Django, Kerry Washington as Hildi and Leonardo DiCaprio as Calvin. Bone Tomahawk is a 2015 movie that features adventure, horror, western and drama. In the Wild West town of Bright Hope, four men, including Franklin Hunt, the town’s fair-minded sheriff; Arthur O’Dwyer, a local rancher; John Brooder, a womanizing gunslinger and Chicory, an aging deputy in Bright Hope, team up to save three people who were kidnapped (Samantha O’Dwyer, Arthur’s wife; Nick, a young deputy in Bright Hope and Purvis, a drifter) by cave dwellers who are cannibals. Bone Tomahawk stars Kurt Russell as Franklin, Patrick Wilson as Arthur, Matthew Fox as John, Richard Jenkins as Chicory, Lili Simmons as Samantha, Evan Jonigkeit as Nick and David Arquette as Purvis. If post-apocalyptic westerns are your thing, then any of these would definitely make you happy! Add them to your watch list and host a movie party with all of your friends! 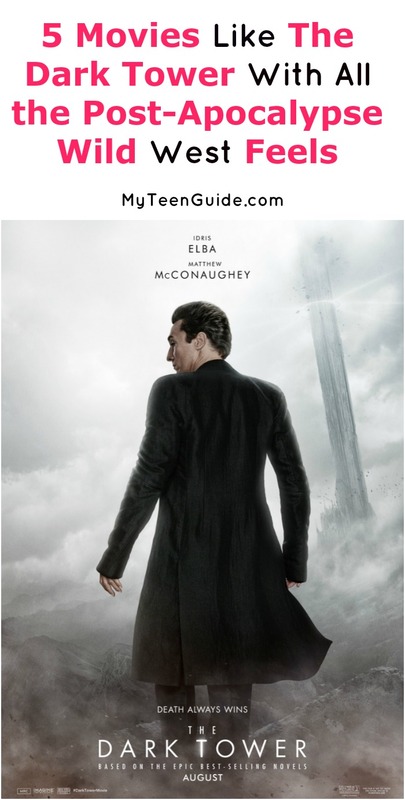 Do you have any favorite movies like The Dark Tower? Share below!